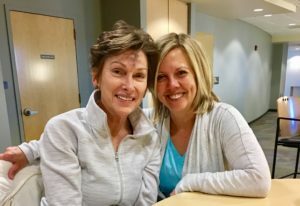 Four Seasons Health Club members Susie Magnuson and Anne Grotbo first met in 1995 while Anne pushed her new son in a stroller around their neighborhood. Along with a third friend, Kris, the women made plans to get together daily for a 30-minute run. A wonderful friendship blossomed during their daily runs as they chatted about everyday life, and according to a smiling Susie, solved world problems. In honor of Anne’s 40th birthday, the trio set a goal of running a half marathon. Together they worked towards this goal, even though Kris had moved to a different state. 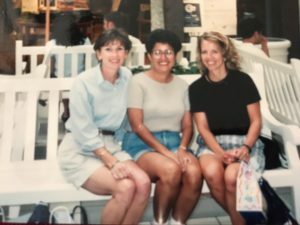 In November of 1998 the friends accomplished their goal, and just one year later, ran a second half marathon to celebrate Susie’s 40th birthday. Shortly after, Susie moved to St. Louis, and as time would have it the friends lost touch over the years. After moving back to the area recently, Susie rejoined Four Seasons Health Club. In November of 2018, she walked into a Killer B’s group fitness class and was surprised to see her friend Anne, who she instantly recognized. “I walked into class and there she was! She looked exactly the same,” Susie shared. “We picked up right where we left off! ” added Anne. Now, 20 years later, the two friends meet for Killer B’s every Wednesday morning followed by a visit over coffee near the Juice Bar. They chat about everyday life and, of course, solve world problems. This entry was posted in Four Seasons News. Bookmark the permalink. Both comments and trackbacks are currently closed.